Rezension: Jessica M. Frazier, Women's Antiwar Diplomacy | Arbeitskreis Historische Friedens- und Konfliktforschung e.V. Rezension: Jessica M. Frazier, Women's Antiwar Diplomacy | Arbeitskreis Historische Friedens- und Konfliktforschung e.V. Jessica M. Frazier, Women’s Antiwar Diplomacy during the Vietnam War Era, Chapel Hill: UNCP 2017. Rezensiert für den Arbeitskreis Historische Friedensforschung bei H-Soz-u-Kult von: Lara Track, History Department, University of Heidelberg. The study is based on an extensive array of sources, including, but not limited to, archival material from 14 institutions, seven published oral history interviews, and 18 interviews conducted by the author herself. While most of the written sources are North American in origin, Frazier spoke to 13 Vietnamese women in person. Her attempt to highlight Vietnamese voices is one of the outstanding features of the book. Frazier continuously draws attention to the agency of Vietnamese women who actively pursued, maintained, and considerably steered relationships with American peace activists. In this aspect she echoes historian Lien-Hang Nguyen who argues that North Vietnamese leaders sought to appeal to different actors within the global antiwar movement by adapting their rhetoric with regard to their audience. By concentrating on Vietnamese agency, Frazier is able to prove the first of her two main theses: While relationships between U.S. feminists and women of decolonizing nations have traditionally been viewed as dominated by the former, she shows that connections between Vietnamese and American women were all but “clear-cut examples of U.S. women’s cultural imperialism” (p. 4). Mary Hershberger, Traveling to Vietnam. American Peace Activists in Vietnam, 1965– 1977, Syracuse, NY 1998; Judy Tzu Chun Wu, Radicals on the Road. Internationalism, Orientalism, and Feminism during the Vietnam Era (The United States in the World), Ithaca 2013. 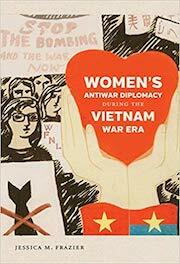 Lara Track: Rezension zu: Frazier, Jessica M.: Women’s Antiwar Diplomacy during the Vietnam War Era. Chapel Hill 2017 , in: H-Soz-Kult, 27.09.2018, <www.hsozkult.de/publicationreview/id/rezbuecher-29248>.